Yarn and Fiber Happenings: Opal Self Patterning Love Story Sock Yarns have Arrived and are on Sale for 15% Off! Opal Self Patterning Love Story Sock Yarns have Arrived and are on Sale for 15% Off! 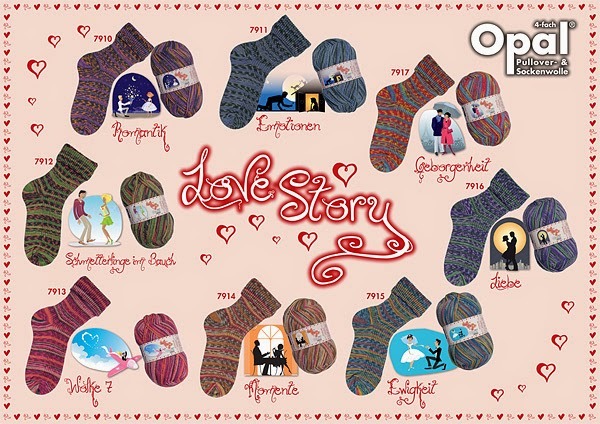 Opal Self Patterning Sock Yarn Love Story have Arrived! Opal Sock Yarns provide an array of beautiful self patterning sock yarns. One skein makes a pair of socks or shawlette at a generous 465 yards per skein. Opal is made from 75% superwash wool and 25% polyamide creating an easy care fabric that is machine washable and dryable. And to put a little extra fun into your knitting, at checkout, enter OPALSOCK in the coupon code to activate a special 15% discount off each skein of this really cool yarn! Coupon good through end of April! Try some today and keep your tootsies warm in style!